I wrote the song below last March during Chicago’s mayoral runoff, but the title applies more than ever, far as I’m concerned. A week after Rahm’s election, Barbara Byrd Bennet, who he picked to run our schools, got indicted by the feds for corruption. Then a 14 month coverup of a policeman’s murder of Laquan McDonald, a black teenager, comes to light. 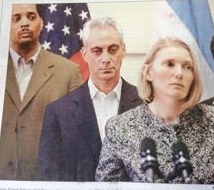 Oh, and remember when Rahm said to vote for him cause his opponent would raise taxes? How’s that working out?